Nollywood Cosmetics is inspired by the Giant of Africa and its bountiful resources.  The products are formulated to enhance beauty and maintain luscious hair. 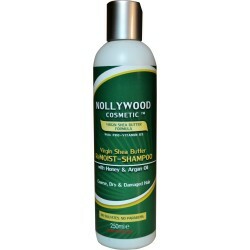 Nollywood Cosmetics There are 11 products. 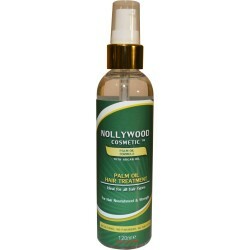 Nollywood Cosmetics - Palm Oil Hair Treatment eliminates frizz and instantly conditions hair. It leaves your hair glossy and soft .It also repairs hair and protects hair against thermal damage. 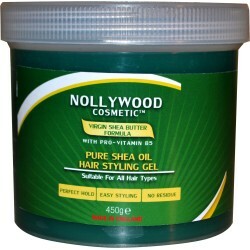 Nollywood Cosmetics - Pure Shea Oil Hair Styling Gel is made up with 100% pure shea butter, olive oil and argan oil. It helps to moisturise hair and scalp. It is weightless and leaves your hair shiny and with an excellent hold. Nollywood Cosmetics - Shea Oil Hair Treatment conditions, nourishes and repairs damaged hair. It repairs split ends and smoothes hair cuticles leaving hair soft, shiny and manageable. 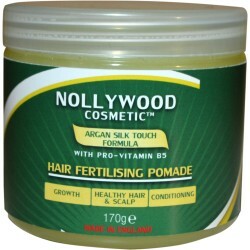 Nollywood Cosmetics – Virgin Shea Butter Hair Fertilising Pomade nourishes and moisturises hair. It helps to fight dandruff and promotes hair growth and a healthy scalp. It strengthens hair and leaves it glossy and shiny. 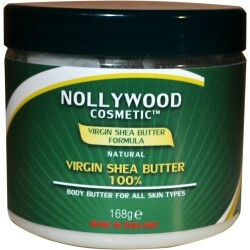 Nollywood Cosmetics - Virgin Shea Butter is 100% unrefined Shea Butter. It spreads smoothly and is easily absorbed by the skin leaving it soft and nourished. It is also suitable for hair and nails. 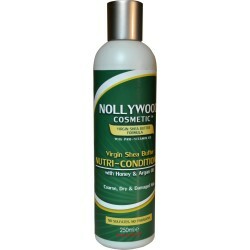 Nollywood Cosmetic Virgin Shea Butter Restore & Replenish Hair Milk nourishes, and repairs dry, damaged hair. This lightweight, non-greasy formula contains raw shea butter and proteins which conditionshair and leaves it soft, moisturised and shiny.